It’s the weekend all about Bollywood’s real-life jodis. As DeepVeer continues the wedding revelry with their A-list colleagues at a reception in Mumbai, Priyanka Chopra and Nick Jonas, India’s national jiju, are enjoying their first few hours of newlywed bliss. The couple tied the knot earlier today in a Christian ceremony at Umaid Bhawan Palace in Jodhpur. Jonas’ father, Kevin Jonas Sr., officiated the ceremony. According to People Magazine, Chopra and Jonas’ wedding bands were made by renowned Swiss jewelry maker, Chopard. American designer Ralph Lauren dressed the bride, groom, their families and bridal party. Lauren played a special part in the couple’s courtship, unknowingly, as he brought them together publically for the first time at the 2017 Met Gala. The bridal party included Chopra’s brother, Siddharth, and Jonas’ brothers, Kevin, Joe and Frankie. Actor and Jonas’ bestie Jonathan Tucker was also included as a groomsman. 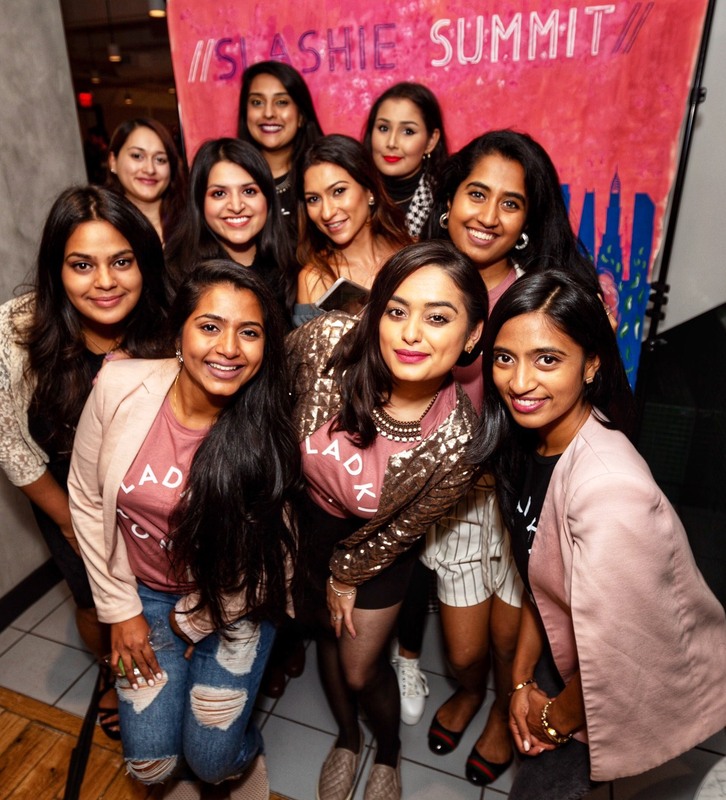 Joe Jonas’ fiancée, “Game of Thrones” actress Sophie Turner, Kevin Jonas’ wife, Danielle, and Chopra’s cousin, Parineeti Chopra, have also been by the couple’s side throughout the weekend festivities. Before arriving in Jodhpur, Chopra’s mother hosted a puja at her home in Mumbai. As family and friends made their way to Jodhpur, the couple welcomed them to the palace with gifts, luggage tags and key cards personalized with their logo and information guides for the eventful weekend. Other well-known guests seen arriving earlier this weekend in Jodhpur include “Glee” star Chord Overstreet, “Bom Diggy” singer Jasmin Walia, actress Elizabeth Chambers, Arpita Khan Sharma, the Ambani family, YouTuber Lily Singh and rapper Humble the Poet. The official celebrations, literally bringing together the East and West, began with a traditional mehndi ceremony. Earlier today, the couple gave us a sneak peek into the mehndi on social media. The pair looks happier than ever in these Abu Jani Sandeep Khosla designs, Chopra in a “folksy, multi-hued organdy ensemble” and Jonas in an aqua bakhiya kurta. The famous fashion team also designed Chopra’s jewelry. Before today’s nuptials, the celebrations were kicked into high gear with a sangeet last night, culminating in fireworks. 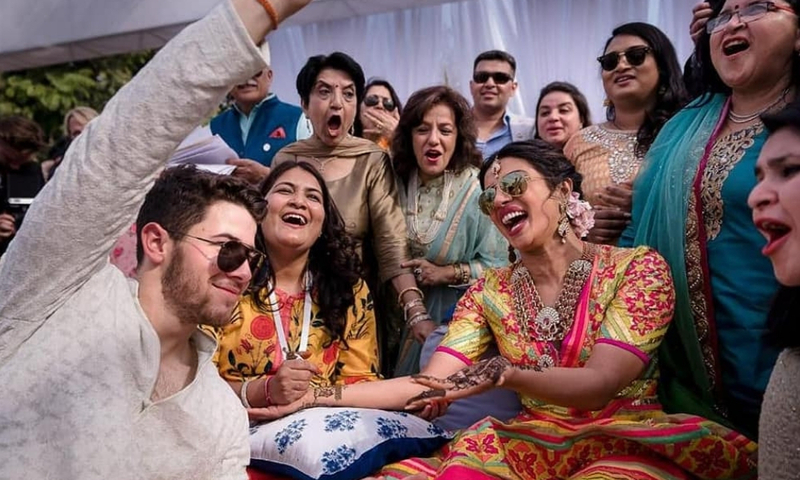 Priyanka Chopra and Nick Jonas will continue to pledge their love to each other in a Hindu ceremony tomorrow, which will also take place at the palace. Vogue honored the couple on the publication’s first digital cover, and Chopra has her own cover story detailing the highlights of the couple’s relationship, including Jonas’ proposal in Crete. Congratulations to happy couple! May your marriage be forever filled with the same blissful love you feel today.